Metro Manila flood control master planning in chronic catch up mode over the last two decades! August 8, 2012 - by benign0 - 12 Comments. â€œWhat weâ€™re hoping is that, with this, we will be able to avoid the Ondoy type of flooding that we saw before,â€ Secretary Ricky Carandang said in a Palace briefing, referring to the tropical storm that caused flash floods of unprecedented magnitude in the capital and parts of Luzon in September 2009. He said two phases of the channel improvement were 87- to 99-percent complete. These included dredging and widening operations and increasing the height of river walls, he said. Carandang cited the overflowing of the Wawa River, whose tributaries lead to the Pasig River, as among primary causes of flooding in Metro Manila. The touted public works along the metropolis’s main rivers are supposedly part of a newly-developed comprehensive flood control masterplan that will cost $13 billion over two to three years. â€œFor us to really resolve this flooding problems, we need to go into that two to three-year project that creates the retarding basins and the dam and all of that. 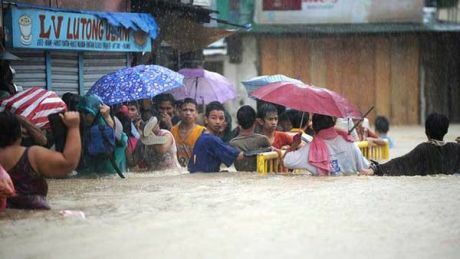 This should minimize the impact of the floods,â€ Carandang said. Interestingly, the Aquino Administration after just a little over one year in power was said to have summarily cancelled projects that aimed to construct flood-control infrastructure initiated by former President Gloria Macapagal-Arroyo. Citing a Department of Public Works and Highways press release dated July 28, 2010, [Representative Danilo Suarez of Quezon who filed in late 2011 a House Resolution calling for an investigation into the effect of President BS Aquinoâ€™s cancellation of these projects] said DPWH Secretary Rogelio Singson cancelled 19 approved negotiated projects worth P934.1 million under the POPSTRIP. The 19 are part of the 139 projects or 42 contract packages funded by the Japan International Cooperation Agency loan for the urgent rehabilitation of flood control facilities worth P1.9 billion. Development of the new flood control master plan now being implemented by President BS Aquino was funded by a $1.5 million grant extended by the World Bank-administered Global Facility for Disaster Reduction and Recovery (GFDRR) Trust Fund to the Philippine Government in January 2011. Secretary Rogelio Singson of the Department of Public Works and Highways said the master plan will inform policy, engineering and financial decisions to ensure that lines of accountability among agencies involved in flood management are clarified and adequate infrastructures are put in place. Equal attention, he said, will be given to non-structural measures such as community participation, catchment protection and reforestation, early warning, and emergency preparedness as an approach to flood management. “Considering that Metro Manila accounts for roughly 40 percent of the Philippine GDP and hosts over 20 million residents, an adequate flood management framework that would provide protection to life and property against floods is a necessary undertaking for the Government,” Secretary Singson said. The formulation of the new master plan will be undertaken for a period of 13 months. The Philippine Government, through the DPWH’s leadership, will provide overall supervision. The technical assistance will build on the various efforts undertaken by the government, stakeholders, and development partners which have built extensive knowledge on disaster risk management and infrastructure planning in Metro Manila. On the 2nd June 2012, the imminent completion of the new flood control master plan was announced by Manuel V. Pangilinan, chairman of the Philippine Disaster Recovery Foundation (PDRF) which, as it turns out, was host to the original meeting of international aid organisations and representatives from the Philippine Government that was to lead to the involvement of the World Bank and its funding of the new master plan. Pangilinan, is also chairman of Philippine telecommunications giant PLDT which supplies data transmission and networking equipment for a network of rainfall detection sites installed as part of the Department of Science and Technology’s (DOST) Project NOAH, which aims to build a modern flood forecasting system. An updated flood control master plan for Metro Manila has long been overdue. A synthesis report “Climate Risks and Adaptation in Asian Coastal Megacities” was issued by the World Bank back in September 2010. It contains the findings coming out of studies jointly conducted by the World Bank, the Asian Development Bank (ADB), and the Japan International Cooperation Agency (JICA). The report highlighted an existing flood-control master plan completed in 1990 with the support of JICA that until now served as the basis for flood control infrastructure projects initiated since then mainly around mitigation of flooding from Laguna de Bay and channeling of flood waters from Metro Manila into Manila Bay. The 1990 master plan featured an infrastructure development regime over a time frame extending to 2050. However, the 2010 World Bank report suggested that even if the full plan was implemented by 2050, a total 52.44 square kilometres of Metro Manila is still expected to remain at high risk of flooding while potentially impacting 1.3 million people owing to new climate change and population growth scenarios that have come to light since then. The Manggahan Floodway to this day still stands as the single biggest flood control work in Metro Manila. It was constructed way back in 1985 to divert flood waters from Marikina River into Laguna de Bay. The disaster and its toll on quality-of-life unfolding across Metro Manila and parts of Luzon today attest to the importance of foresight around not just infrastructure but also population growth, human habitation (particularly areas “informally” inhabited), and employment opportunities outside of already congested urban areas in the Philippines. Previous Article Could the Php 1.9 bn in flood control projects axed by Noynoy Aquino have saved Metro Manila from destruction? Well too much of pangilinan huh, unless he already represents the first P from PPP -(Pangilinan-Public Partnership)? But I agree, maybe one of the main reasons why the government finds it difficult to solve the flood control problems especially in ncr is because of unpredictable growth of human settlements in the region, well aside from the fact that flooding like this one is really near uncontrollable, bad thing is that these are informal human settlements found near or if not on top of flowing creeks, rivers, and streams and coastal areas. Worst, some of these are said to be protected by some politicians who take advantage of them during voting seasons. Well why do I say so, often the lack or absolete discipline if not no discipline at all among these people leads to uncontrollable environmental-related problems, waste management to be precise. In superstition, if you show care to your environment then the more that the environment will take care of you talking about natural phenomenon. And yet we end up blaming the government for putting our own lives at risk. Keep Safe Everyone! The problem is that there is no effective flood control… period. Maintenance is not even done anymore. The government should have started cleaning up drains, manholes and waterways last summer. I remember the Blumentritt interceptor being dredged every summer during past administrations. The summary cancellation of dredging flood control projects worsened the flow in the waterways. Mr. BS Aquino should prioritize flood control. One more thing. what happened to the manholes that were covered up by road asphalt overlay? Please wake up! Covering that manholes have no sense of accountability. DPWH simply do not care! this is the same pangilinan that owns the electricity? he has too much to do with all these disasters and is probably causing a ot of it on purpose.FILIPINO’S are sick of being led by crooks and thieves?sure. coastal areas so as to begin the first phase of “island ph fortress”! When Pork Barrels of politicians and this useless President are more important than the fund for flood control. We have this problem. What is the reason, Noynoy Aquino cancelled the Master Flood Control Plan? Noynoy Aquino has a Hidden Agenda in cancelling the Master Flood Control Plan…Ilunod natin ang tarantado!!! We have urban planners like Architect Jun Palafox. Why is it the government not listening to him. President Aquino please avail of the services of Architect June Palafox and maybe some Dutch experts on water management.